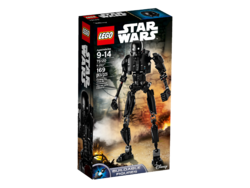 75120 K-2SO is a Rogue One Buildable Figure released in 2016. This is a description taken from LEGO.com. Please do not modify it. 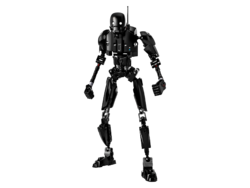 (visit this item's product page) Infiltrate the Empire with buildable and highly posable K-2SO. This former Imperial security droid features a single/double-arm-swinging battle function, tough-looking decorated head and armor elements, and is extra tall for an even more impressive figure. This durable droid is perfect for dangerous missions against the Empire. Buildable and highly posable K-2SO figure features single/double-arm-swinging battle function, tough-looking decorated head and armor elements, and an extra-tall frame. Activate the single/double-arm-swinging battle function. Enter battle with this ominous looking buildable figure. Move the limbs into any battle pose. Sturdy and durable design for intense action play. Play out exciting hand-to-hand combat with this exciting droid from the blockbuster movie, Star Wars: Rogue One. This figure offers an age-appropriate building experience for ages 9-14. Figure stands over 11” (29cm) tall. This page was last edited on 18 August 2017, at 01:23.